Best Natural Man Beard Oil is a conditioner and tamer for a man's beard, mustache or a goatee with Lavender, Mandarin, Rosemary and Spearmint. Formulated with the finest natural vegan oils, these therapeutic botanical oils condition, maintain your beard and soften rough hair and skin. Best Natural Man Beard Oil is a conditioner and tamer for a man's beard, mustache or a goatee with Lavender, Mandarin, Rosemary and Spearmint essential oils. Formulated with the finest natural vegan oils like coconut, almond, Jojoba, Squalane and Vitamin E, these therapeutic botanical oils condition, maintain your beard and soften rough hair and skin. Beard oil tonic will make those whiskers softer and more manageable with a light pleasant manly scent. It contains the original natural therapeutic blend of Lavender, Mandarin, Rosemary and Spearmint. The aromatherapy essential oils provide natural scent and health benefits for the beard and the skin. When used on a regular basis, Natural Beard Oil leaves the beard, mustache or goatee nourished and maintains the health of your whiskers. The benefits of Natural Beard Oil for men are many. It helps the hair and skin to be healthy. It adds shine and strengthens the hair naturally. It helps with split ends, frizzy hair and detangles for a thicker fuller facial hair. Beard oil keeps the skin dryness and itchiness away. It replenishes and balances the beard and the skin. 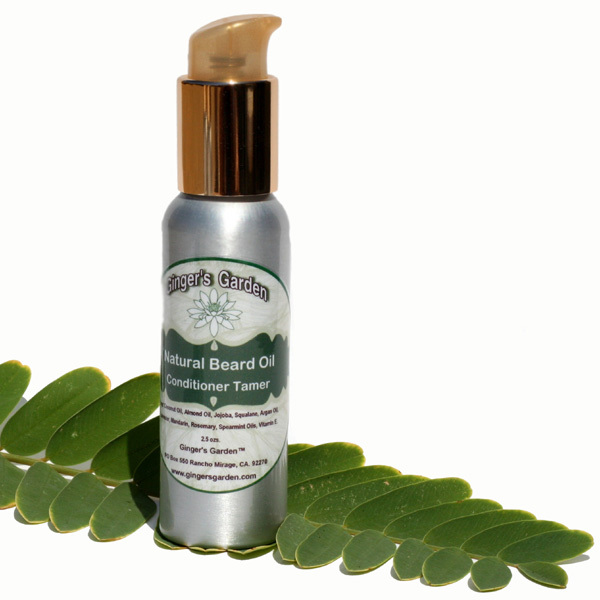 Natural Beard oil comes in a 2.5 ounce aluminum bottle with a dispensing cap for ease of use. The special bottle protects the natural botanical oils and helps them last longer. For best results use 5-6 drops into your hands, rub the hands together then massage into the beard, mustache or goatee and into your skin. For an extra bushy beard use a couple more drops. It can be used on damp or a moist beard or used the tamer and conditioner oil after a shower. The drops of Beard oil can be combed through the beard with a wide tooth comb if desired. This will distribute the oil more evenly. Rub any extra into your hands so they get the benefit of moisture too. Use morning and night for the best benefits. Beard oil for men can be used for any type of skin or hair. It adds moisture to dry scalp too or use it on the rest of the body. Just as you condition your hair, you should condition your beard, mustache or goatee too. Can be used after shaving to add moisture to your skin. Handmade Natural Beard oil can be used with your favorite shaving cream, shave soap, after shave or cologne. Get your facial hair under control! It has no alcohol or artificial ingredients. Buy the Best Beard Oil for your facial hair from Ginger's Garden. Makes a wonderful unique gift for any man. This product is naturally vegan and contains no animal ingredients. Pure Coconut oil - A wonderful natural oil known for its moisturizing properties. It helps with dry skin, frizz and split ends. Sweet Almond oil - A mild oil that benefits the hair follicles. Adds nourishment to the beard and skin and absorbs easily. Nourishing Jojoba oil - One of the best oils used for skin and body care. It's very compatible with the structure of skin and facial hair. Does not leave behind oily residue. Natural Squalane oil - Rich in nutrients, it's a luxury vegetable oil obtained from olives. Helps replenish lost moisture to dry beard or mustache and offers a smooth feel to facial hair. Luxury Argan Oil - Rich in Vitamin A, it leaves the beard smooth, manageable and helps eliminate frizz. It is a lightweight oil that's also called liquid gold. Natural Vitamin E is an antioxidant that helps extend the shelf life of oils with natural affinity to the skin and hair. It is effective as a moisturizer in a blend of other vegetable based oils. Lavender essential oil has been traditionally used in skin and facial care for its calming and soothing properties. Mandarin essential oil is a happy uplifting citrus oil that has been used in times past for its antiseptic and sedative properties. Rosemary aromatherapy oil is used extensively in hair care. It is a stimulating and invigorating essential oil that naturally conditions the hair. Spearmint oil in a blend helps reduce or calms itching. It is a gentler oil then Peppermint. Spearmint is a crisp, minty and refreshing essential oil. Ingredients: Natural Coconut oil, Sweet Almond Oil, Jojoba, Squalane, Argan oil, Lavender essential oil, Mandarin, Aromatherapy Rosemary oil, Spearmint, Vitamin E.
Contains no mineral oil, synthetic color, surfactants, Propylene Glycol, Sodium Lauryl Sulphate or Sodium Laureth Sulphate.